A Californian pastor, who put up a transphobic sign outside his church claiming that Caitlyn Jenner is “still a man,” has said he has been forced out of his role. 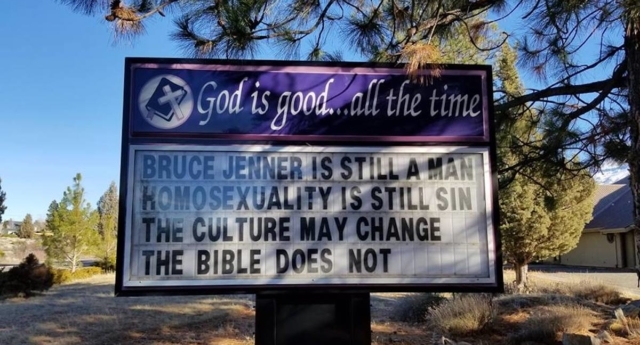 Justin Hoke, former pastor at Trinity Bible Presbyterian Church in the town of Weed, has said he was made to leave his job at the congregation following backlash over the sign, which also dead named Caitlyn Jenner. “As of today, I am no longer the pastor of Trinity Bible Presbyterian Church,” Hoke wrote on Facebook on January 12. “Therefore it was determined that it would be in the best interest of the local body for us (TBPC and the Hoke family) to part ways,” said Hoke. It is believed that Hoke put up the sign on behalf of Trinity Bible Presbyterian Church on December 31. “The culture may change, the Bible does not,” the sign also stated. Protestors from the local community were quick to show their support for LGBT+ residents in the town. A group assembled outside the church over the weekend with their own pro-LGBT+ signs. “Jesus had 2 dads and he turned out FINE,” read one placard. Speaking to KTVL, one activist said: “I’m here to support individuals of our community, regardless of gender identity, sexual orientation, marital status, or other elements that make people unique. Justin Hoke, pastor at Trinity Bible Presbyterian Church, however, previously defended the sign on social media. He uploaded an image of the sign on Facebook on December 31. “It is not possible to preach the gospel in short pithy statements,” he wrote in a comments beneath the image.